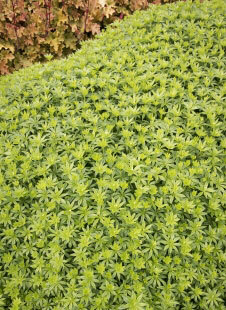 Groundcover plants are dependable and solve many gardening and landscaping problems. They can be low and creeping or tall and full. These low-maintenance plants carpet the ground and are great to fill in awkward spaces. They can help deter weeds and are even used as a grass alternative at times. Drought-tolerant ground cover plants are great for landscaping if you live in a dry area and are looking to conserve water. Thyme is a fragrant herb that can be either creeping or upright. Small green leaves grow on woody stems and can be used fresh or dried. 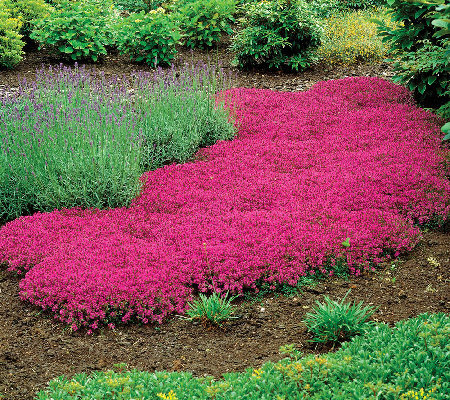 Creeping thyme can tolerate mild-moderate foot traffic. Use it in a rock garden or between stepping stones. 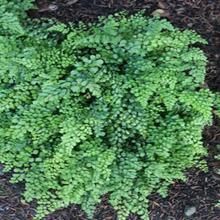 Sedum is a large category of plants that are excellent for low-water locations. 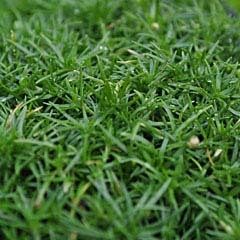 There are tall varieties as well as creeping varieties that produce dense mats no tall than 3 inches. They have thick, fleshy, evergreen leaves and flowers of yellow, orange or pink. 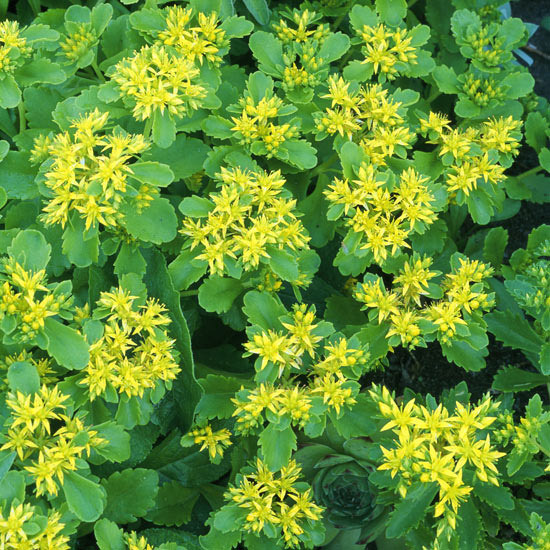 Look for Kamtschaticum sedum. 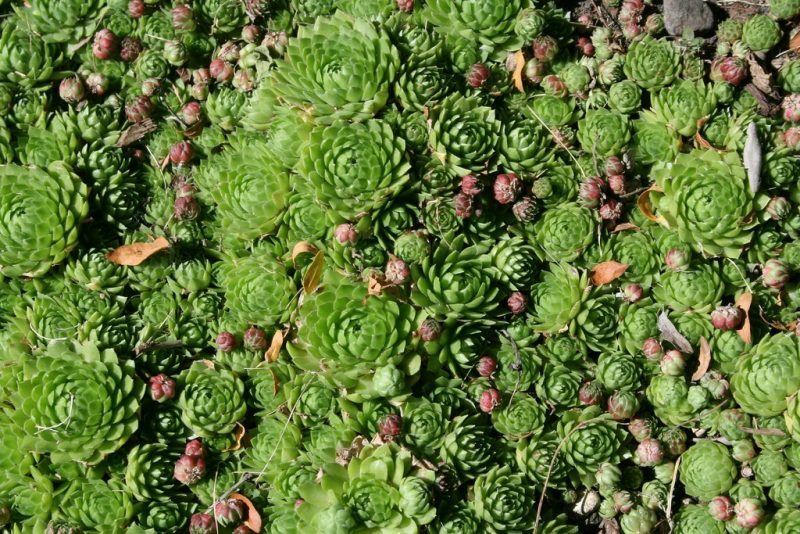 Hen-and-chicks are a type of succulent that grows in beautiful rosettes. They grow well in tight spaces and add wonderful textural interest to a garden. These groundcover plants grow best in areas that receive less than 6 hours of sun per day. Sweet woodruff grows in low clumps of green foliage on upright stems. They do well in very dense shade which can be a hard spot to fill in. The plant produces tiny, white flowers that bloom in the early spring. Bishop’s weed grows quickly and can spread aggressively. Plant it in an area where it can take over without any competition or in a contained area. It can reach up to a foot in height and loses it leaves for the winter. 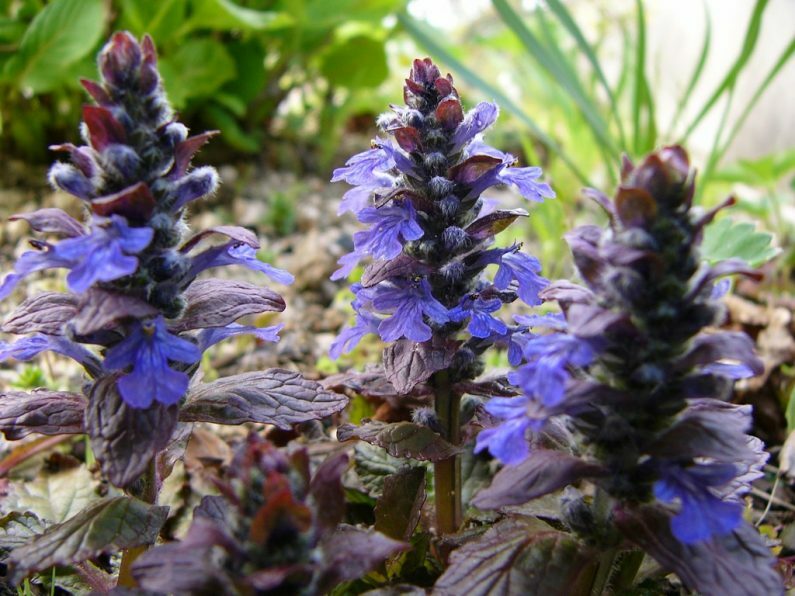 There are many varieties of ajuga; all spread easily and are easily to control. Ajuga can tolerate moderate foot traffic, but avoid places with heavy use. 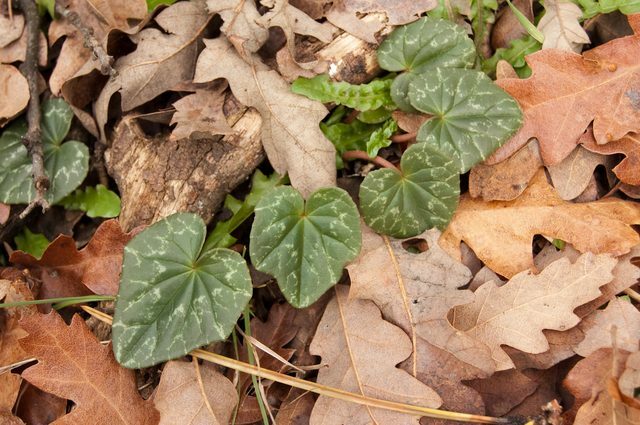 The scallop-shaped leaves of this groundcover come in many shades such as green, maroon, bronze, pink, purple, or white. Flowers are pink, blue, purple, or white and bloom in the spring. Evergreen plants retain their green color year round. This low-growing perennial features black and green fern-like, feathery leaves. 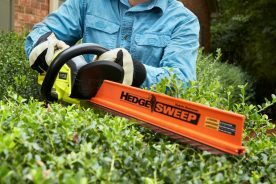 It is great for filling in spaces and grows quickly which helps keep weeds at bay. 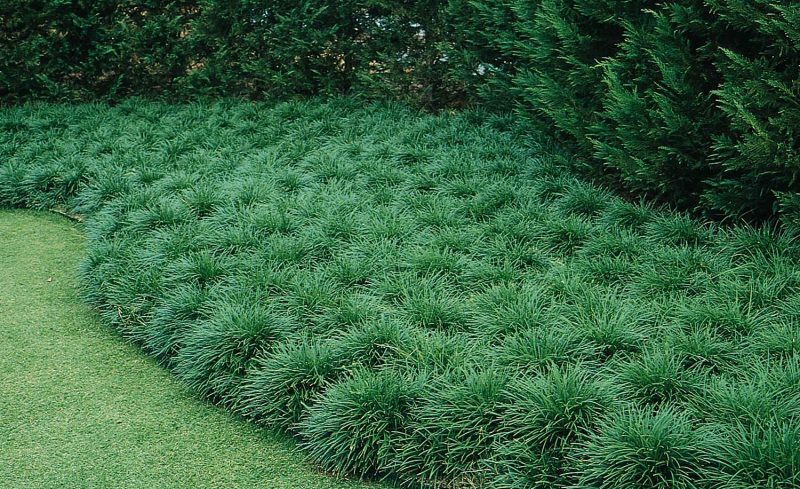 The dense carpet-like growth may be used as a grass substitute on the lawn. Mondo grass is a misnomer as it isn’t really a grass, but instead looks it. It has slender leaves in various shades of green and can grow between 3 to 24 inches in height. It looks best in borders. 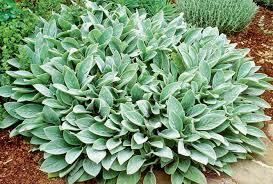 Lamb’s ear is a perennial with fuzzy, soft leaves in a silvery shade of green. It can spread up to 48 inches, depending on the variety. Tiny flowers appear in the summer, but can be removed so the leaves remain the focus. Creeping groundcover are low-growing and vine-like. 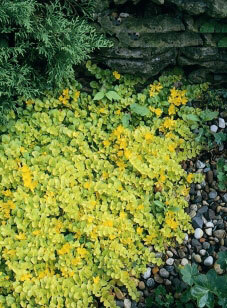 Creeping Jenny forms a dense, low mat of yellow leaves with yellow flowers from the late spring to summer. It spreads quickly and looks lovely in containers or cascading over walls. Creeping phlox creates a beautiful carpet of purple, pink, or blue star-shaped flowers in the spring. 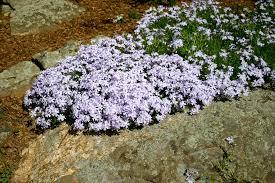 It is a lovely ground cover in a flower bed or a rock garden where it can hang over the edge of a wall. This dense groundcover spreads by underground stems so be sure to plant in an area where it can take over and has room to grow. 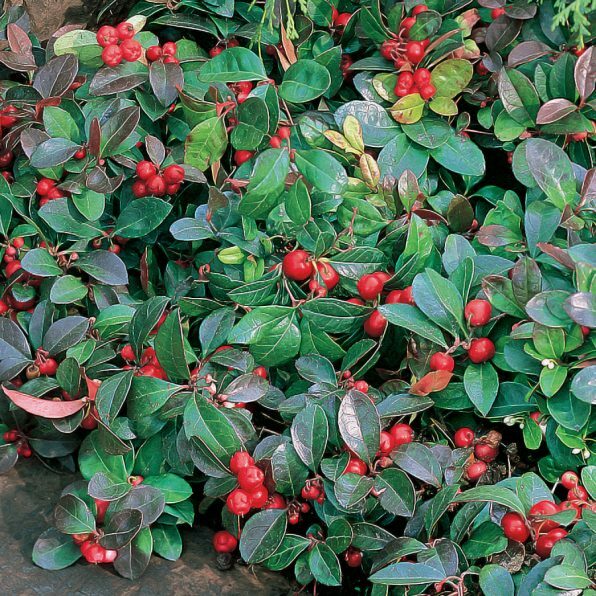 With evergreen, oval-shaped leaves the plant produces small flowers followed by bright red berries in the fall. Miniature plants are great for fairy gardens or creating miniature landscapes in a container. These plants are great for the low-growing element. This slow-growing vine features dark, shiny green foliage. It does not get larger as it grows making it perfect for a terrarium or fairy garden. This low-growing plant grows as a thick, dense mat. The leaves are small and thin giving the whole plant an appearance of moss. It produces white, star-shaped flowers that bloom in the spring. This miniature plant grows as a thick carpet of fern-like leaves. It works well between stepping stones or in a rock garden. Ivy is a classical plant used to fill in vertical spaces such as on a trellis, arbor, or wall. It can also be used as a ground cover, container, or house plant. 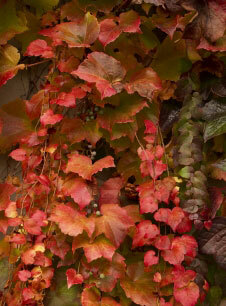 There are many varieties of ivy and as a result there are many different growth requirements. They are vigorous growers which can cause control problems in some circumstances and are even considered invasive species in some states. 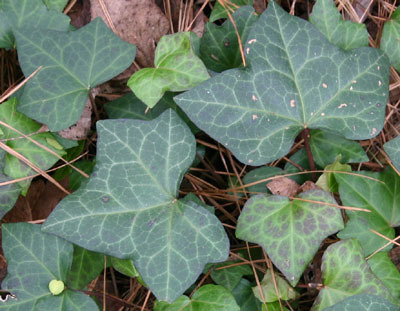 English ivy is the most frequently used ground cover in the US. It is also used as a climber due to its ability to cling to most surfaces. 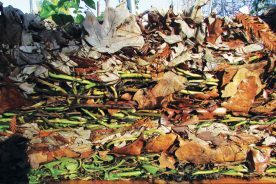 Tiny roots grow along the stems help it to secure itself to walls, trellises and trees. English ivy grows best in shady spots and don’t require much in the way of care. Plant it in an out-of-the-way location and let it go. Plant new vines 18-24 inches apart. The first year’s growth will be slow, but after the second year the vine will take off growing up to 50 feet in length. Plant in a container with a trellis for support or in a hanging basket and let it trail over the side. Water often enough to keep the soil moist while the new plants are establishing themselves. 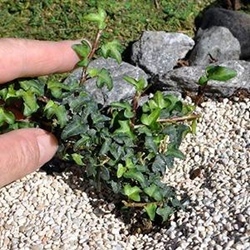 When used as groundcover trim the tops in the fall to encourage new growth. English ivy rarely needs fertilizer, but if it seems the plants are not growing as they should use a liquid fertilizer at half strength. Irish ivy is closely related to English ivy and shares similar growth requirements. The shiny, green leaves of Irish Ivy are broader and longer than English ivy. 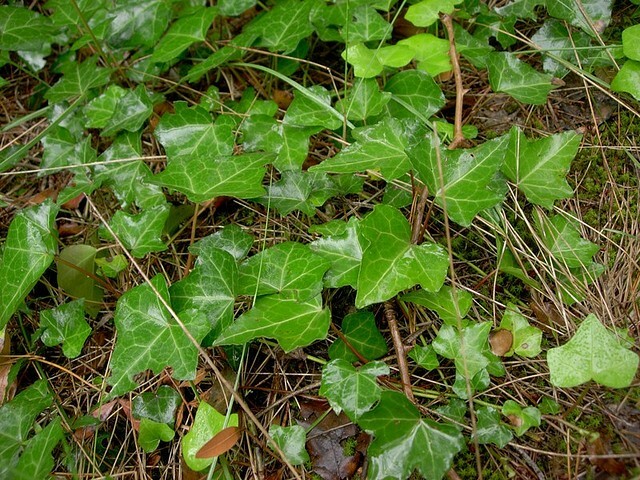 Irish ivy tends to spread on the ground and over small shrubs, rather than climb. Sometimes called Canary Island ivy, this ivy can grow up to 30 feet in height. Like other ivies, it can really take off so plant it in a place where it can be contained. 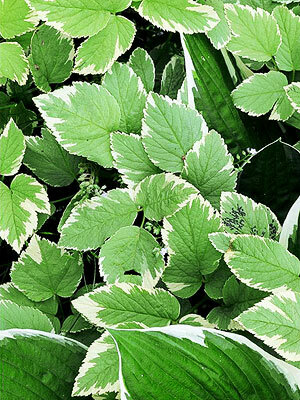 There are several varieties that include variegated leaves, yellow leaves, or large-sized leaves. Boston ivy is also called Japanese ivy. It is the ivy from which the term ‘Ivy League’ comes. It is a fast grower and can quickly take over an area so plant it where it can be contained. If you don’t wish to handle the aggressive growth, but love the look, Boston ivy can be grown as a house plant. Outside it can spread to 15 feet and grow up to 50 feet tall. Continuously trimming it will help it appear as a small shrub and will prevent it from taking over. In the fall the green foliage turns a lovely red-purple. 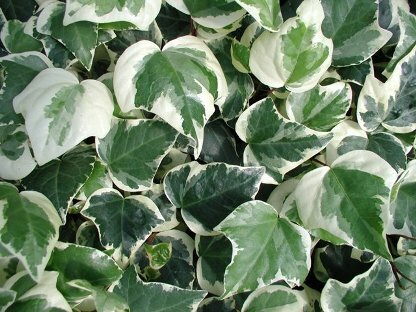 Bullock’s heart ivy features large, heart-shaped leaves sometimes with white variegation. It is also known as Persian ivy. The leaves are the largest of any ivy variety growing between 4 and 10 inches in length. Flower of the Month: Do you Know your Birth Flower?